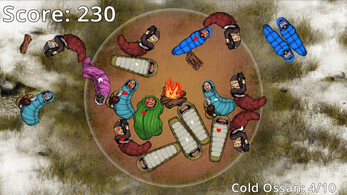 Help keep the ossan (Japanese for "Old Dude") warm so they can sleep! Best enjoyed fullscreen with sound. Click and Drag to move the ossan around. Ossan appear at the edges of the level. Drag them within range of the fire and they will start sleeping. As they sleep you can see how much time until they are rested. 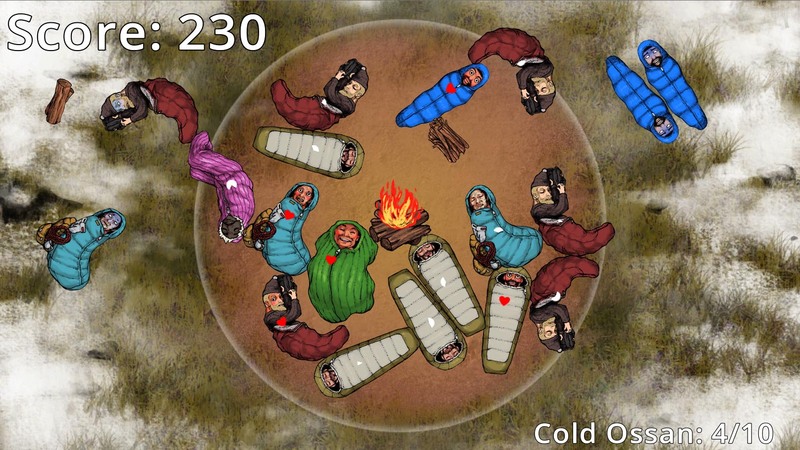 When ossan are rested, remove them from the fire range to score points. If you remove multiple rested ossan in quick succession you get a combo multiplier, this can dramatically increase your score. The fire slowly gets smaller. Logs appear at the edges of the level. Drag them into the fire to make it bigger. If 10 or more ossan are out in the cold, it’s Gameover.